The American Psychological Association (APA) and Hypothesis are pleased to announce a partnership to bring annotation capabilities to content hosted on APA’s PsycNET platform. By embedding this key collaborative technology, APA will make it easier for authors, researchers and readers to use and explore multiple conversations in addition to the publisher version of record. 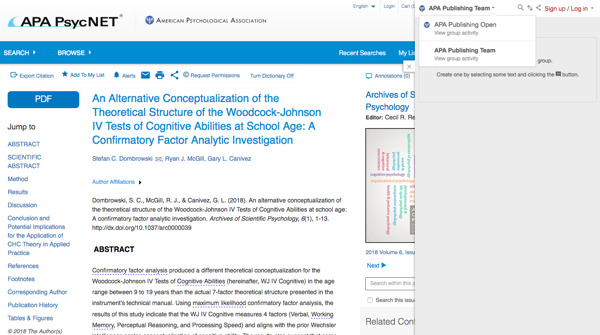 Using Hypothesis Publisher Group functionality, APA will enable access to branded and moderated discussions for updates, links to additional resources and interactive post-publication commentary. There will be an open group in which anyone can participate and a restricted group dedicated to author or staff annotations. Each of these annotation layers will have a group activity page for discovery and exploration of annotations. “APA supports openness and rigor in psychological science and this partnership provides a new pathway for authors, researchers, students and other users to engage with each other about the rich content in APA PsycNET,” said Rose Sokol-Chang, APA’s Journals Publisher.